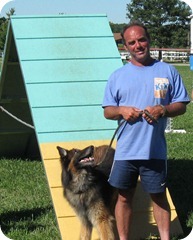 I began my agility career in 1999 with my first Belgian Tervuren, Kodi (1998-2007.) Like so many others, I was just looking for a fun activity to do with my dog. We both loved it so much–the team work involved and the satisfaction–that it wasn’t long before I was hooked and actively competing. In AKC, Kodi and I completed his MX and MXJ. In USDAA we completed his ADCH–which includes having completed all 5 Master level class titles. We began training at Cleveland All Breed, and by 2005 I became an instructor there. With my second agility dog, Indy (2003- ), another Belgian Tervuren, we have completed his AKC MX and MXJ, and are closing in on his MACH. In USDAA, he has completed the requirements for his MAD, and all of the Masters level Non-Standard titles. As he has all of his Tournament Qualifiers as well, as of July 4, 2010, Indy is one Standard Q away from his ADCH. In limited showing in CPE, Indy had achieved CL3-RFS. I have recently started seriously trialing with my newest Belgian Tervuren, Kinsey (2007- ). In AKC we have earned her OA and OAJ titles. In USDAA, her Starters Versatility AD title, and also titles in Advanced Standard and Jumpers, and in CPE she has CL1 CL2-RHS. As a trainer, I have found that I continue to learn from every dog I meet. My philosophy is to build confidence in our dogs by giving our dogs a complete understanding of what we are asking them to do, to take small steps in training something new, to reward our dogs when they get something right, and never let them think they have done anything wrong. And most importantly, I have learned to strive to keep training fun! !